Collider was in attendance this morning at a press event in Burbank where Warner Bros. Home Entertainment Group celebrated their 90th anniversary* (*technically the company turns ninety on April 4th, 2013) by unveiling their new 90-year logo and announcing a slate of new Blu-ray and DVD transfers. However the biggest surprise was an announcement that they’re currently working on a special restoration and conversion of the 1939 classic The Wizard of Oz from 2D to 3D. The new 3D edition of The Wizard of Oz will hit shelves everywhere sometime next year in September or October. Also announced this morning, two new documentaries on working at the Warner’s Lot, a 100 DVD Collection of the Best Films from Warner Brothers and a 50 Blu-ray Collection of the Best Films from Warner Brothers, among others. For the full press release, a list of just what movies are included in the 50/100 film sets, a trailer for the sets, and images, hit the jump. — Harry, Albert, Sam, and Jack — incorporated on April 4, 1923. Four years later, the release of The Jazz Singer, the world’s first “talkie,” set a tone of innovation and influence that would forever become synonymous with the Warner Bros. brand. Soon to be 90, Warner Bros. continues to entertain the world with films passionately produced, selectively acquired, carefully preserved and impeccably curated for both the casual and ultimate movie lover to enjoy forever. As a result of all the films the studio has produced, co-produced (with numerous partners), acquired and distributed, Warner Bros. now boasts the largest film library in the world – 6,800 feature films, with 2,000 films currently available on DVD and Blu-ray™. The library includes 22 Academy Award®*-winning Best Pictures (the most in Oscar® history), and leading franchises such as Harry Potter™, Batman™, Lord of the Rings™, The Matrix and Superman™. Beginning in January, Warner Bros. Home Entertainment Group (WBHEG) will launch a major Anniversary initiative that will continue through year-end 2013. This includes the release of seven new collections, including two limited and numbered anniversary collections — 100 films on DVD and 50 films on Blu-ray™, both the largest collections ever released, to date, in their respective formats. The year-long celebration will also include several stand-alone releases of new-to-format classics on Blu-ray™ for the first time, including The Jazz Singer, all three James Dean films (East of Eden, Rebel Without a Cause, Giant), Cabaret and Academy Award® Best Picture Winners Grand Hotel (1932), Mrs. Miniver (1943), and Driving Miss Daisy(1990). 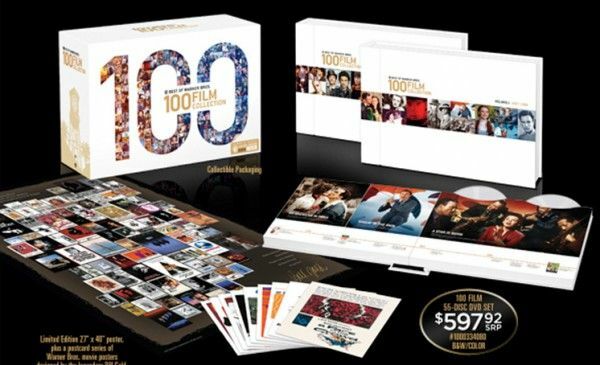 The Best of Warner Bros. 100 Film DVD Collection*: 100 movies including all 22 of Warner Bros. library’s Best Picture ™ Winners and two new documentaries (details below) on 55 discs presented in book style premium packaging. 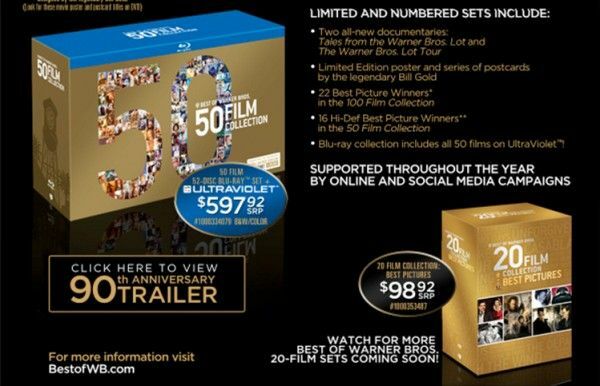 The Best of Warner Bros. 50 Film Blu-ray™ Collection* includes 50 movies and the two new documentaries on 52 discs, also presented in book style premium packaging. It will introduce several new-to-Blu-ray film titles, including Grand Hotel, Mrs. Miniver, and Driving Miss Daisy. The Best of Warner Bros. 20 Film DVD Collections will be released throughout the year in five separate sets. Each features a gem-packed collection of 20 essential movie classics in five major genres: Best Pictures (January), Musicals (February), Romance (April), Comedy (July) and Thrillers (September). The Best of Warner Bros. Animation Collections will be released throughout the year in three separate animation sets. Each features animation at its best in three key brands Hanna-Barbera (May), Looney Tunes (June) and DC Comics (August). The Best of Warner Bros. Superman Collection (May) features 9 essential Superman live action television and animated television shows in one collection. • Blu-ray • Entertainment • Movie • The Wizard of Oz • Warner Bros.